Robert Lowell was born in 1917 into one of Boston's oldest and most prominent families. He attended Harvard College for two years before transferring to Kenyon College, where he studied poetry under John Crowe Ransom and received an undergraduate degree in 1940. He took graduate courses at Louisiana State University where he studied with Robert Penn Warren and Cleanth Brooks. His first and second books, Land of Unlikeness (1944) and Lord Weary's Castle (for which he received a Pulitzer Prize in 1946, at the age of thirty), were influenced by his conversion from Episcopalianism to Catholicism and explored the dark side of America's Puritan legacy. Under the influence of Allen Tate and the New Critics, he wrote rigorously formal poetry that drew praise for its exceptionally powerful handling of meter and rhyme. Lowell was politically involved-he became a conscientious objector during the Second World War and was imprisoned as a result, and actively protested against the war in Vietnam-and his personal life was full of marital and psychological turmoil. He suffered from severe episodes of manic depression, for which he was repeatedly hospitalized. Partly in response to his frequent breakdowns, and partly due to the influence of such younger poets as W. D. Snodgrass and Allen Ginsberg, Lowell in the mid-fifties began to write more directly from personal experience, and loosened his adherence to traditional meter and form. The result was a watershed collection, Life Studies (1959), which forever changed the landscape of modern poetry, much as Eliot's The Waste Land had three decades before. Considered by many to be the most important poet in English of the second half of the twentieth century, Lowell continued to develop his work with sometimes uneven results, all along defining the restless center of American poetry, until his sudden death from a heart attack at age 60. 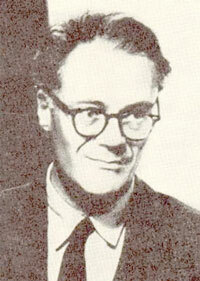 Robert Lowell served as a Chancellor of The Academy of American Poets from 1962 until his death in 1977.